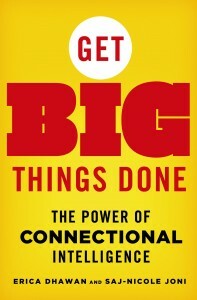 In my new book Get Big Things Done: The Power of Connectional Intelligence, my co-author Saj-nicole Joni and I talk about the central roles 10 different models of connectionally intelligent people play in cutting through the noise of our over-crowded digital world and using connection to accomplish remarkable results. In this excerpt, we describe one model, the Empathetic Entrepreneur, and discuss how this type of person can leverage their connectional intelligence to drive innovation and create amazing value for their communities, businesses and lives. What makes someone an empathetic entrepreneur? The traits that define them are passionate, tenacious, and adaptable. They aspire to be a creative visionary. This person wants to be his or her own boss, but also wants to fill a real need. Empathetic Entrepreneurs are creative and driven; they are authentic salespeople, not hustlers. They are those who stop and listen to connect with their customers and fans on an emotional level, putting themselves in service to others. They collect data before they make a big move, building the fuel needed to push past challenges that arise and bring something creative and new to the world. Most importantly, they really listen, all along the way, making sure that the work they are doing is delivering something that people actually want. We’ve seen this in entrepreneurs we describe in the book like burqini creator Aheda Zanetti, lifestyle blogger and YouTube celebrity Michelle Phan and rapper-turned-change-agent Pharrell. Broaden the possibilities of who you might serve. If you spend time talking to people and observing their needs, creative ideas start to appear, but often they can help more constituencies than you might imagine. For example, Aheda Zanetti’s move to Australia led her to create the world’s first two-piece burqini, made of lycra and with a hijab-style head covering, which allow Muslim women to be active on the beach and now serve non-Muslim women who want to be fully covered for many different reasons. Michelle Phan deeply listens closely to her fans and has cultivated viewers from all around the world by discussing different styles from different cultures—from Korean celebrities to French teenagers. Fail fast and fail forward. If you are an Empathetic Entrepreneur, you must dabble, play, mess around and experiment. It hardly matters if you are good at it or not at first. You can move on to another form or genre without having to worry about humiliation of failure. For example, Pharrell took a big risk when he moved away from the typical music persona of most famous rappers. He tied everything he was working on back to that sustaining purpose of being proud and genuine in his nerdiness (as opposed to the cool music industry persona he sometimes adopted) and the desire to make a difference in the lives of young people who were outsiders, like himself. This internal compass led to the greatest breakthrough of this career. Set up a system of incremental rewards to sustain your business over the long term. Being an Empathetic Entrepreneur takes guts and requires structures that fuel your passion and energy. For example, the daily support and input Michelle Phan receives from her fans helps her to connect more deeply with her community and create new videos based on what her fans are asking for, and fuels her for her work. Take the time to build structures to re-energize and keep connecting with the deepest needs of who you serve. Erica Dhawan is the CEO of Cotential and keynote speaker driving innovation across generations and cultures to prepare the global workplace for tomorrow. Pre-order her forthcoming book: Get Big Things Done: The Power of Connectional Intelligence by Erica Dhawan and Saj-nicole Joni.